This module will help to create new Sales representative which manages the quotation request efficiently and in an organized manager. Dedicated Sales reps agents are created for the products and categories. Managers can be created and admin can assign different sales rep agents to the managers so that the managers can keep a track over the sales rep agents. Installation of the Opencart Sales Rep module is very simple. You just need to move Admin and Catalog folder into the Opencart root. You can also install the Opencart Sales Rep module by uploading the Sales_Representative.ocmod.zip file through Extension>Extension Installer. After the installation gets completed, the admin can edit the module by clicking on the edit button. 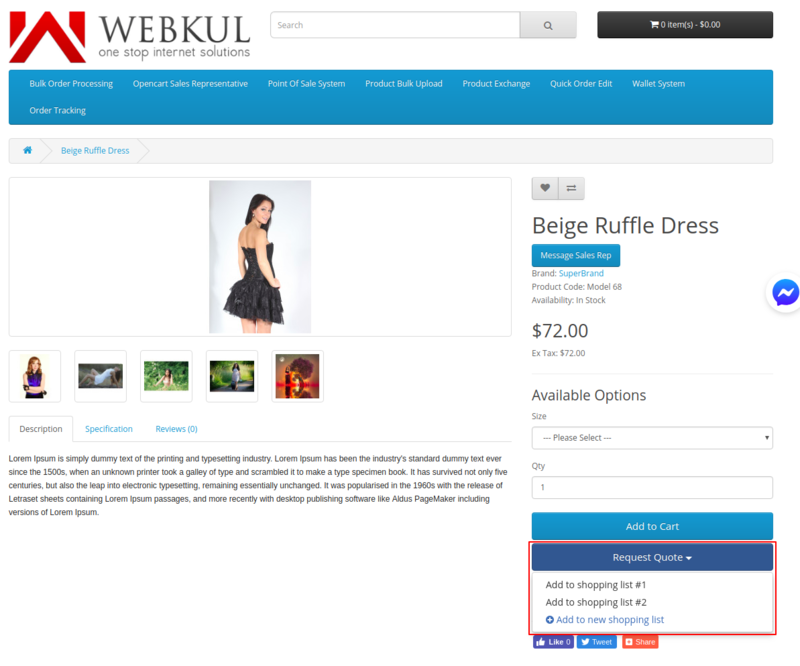 On clicking the edit button, Sales Rep page will appear as shown in the image below. The admin can set the Status of the module as enable or disable. Once the status is set enabled the admin can also configure the module by navigating to Sales Representative > Config Settings as shown in the image below. Assign Manually – The admin can set the sales rep agents to be assigned automatically or manually. If the assign manually option is set as Disabled then the admin can set the priority rules based on which the sales rep agent will be assigned to a particular quote. 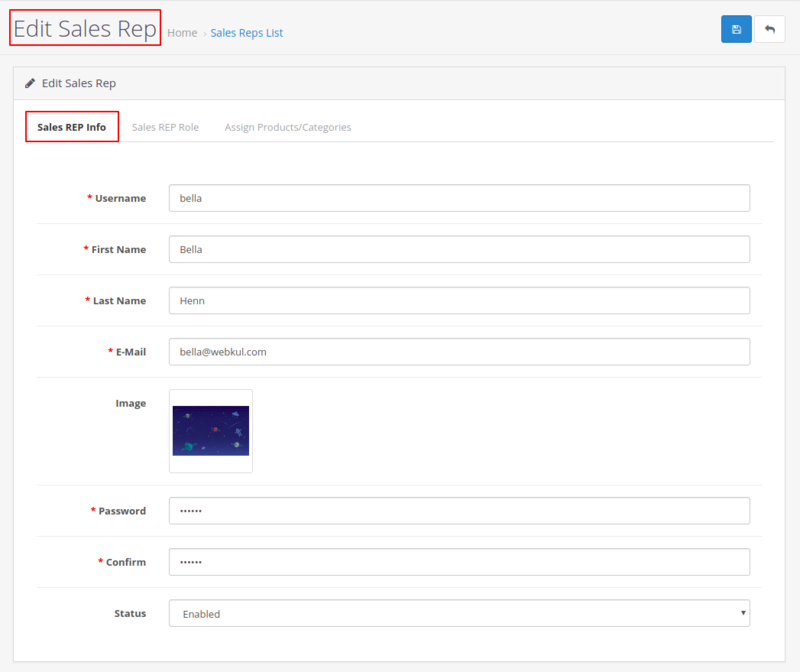 If the assign manually is set as Enabled, then the admin will have to manually assign the sales rep.
First Contacted Sales Rep is the Dedicated Sales Rep. Customer Most Quotes assigned to Sales Rep. Sales Rep will Lowest assigned Quotes. Under the following section, the admin can be set the default sales representative. 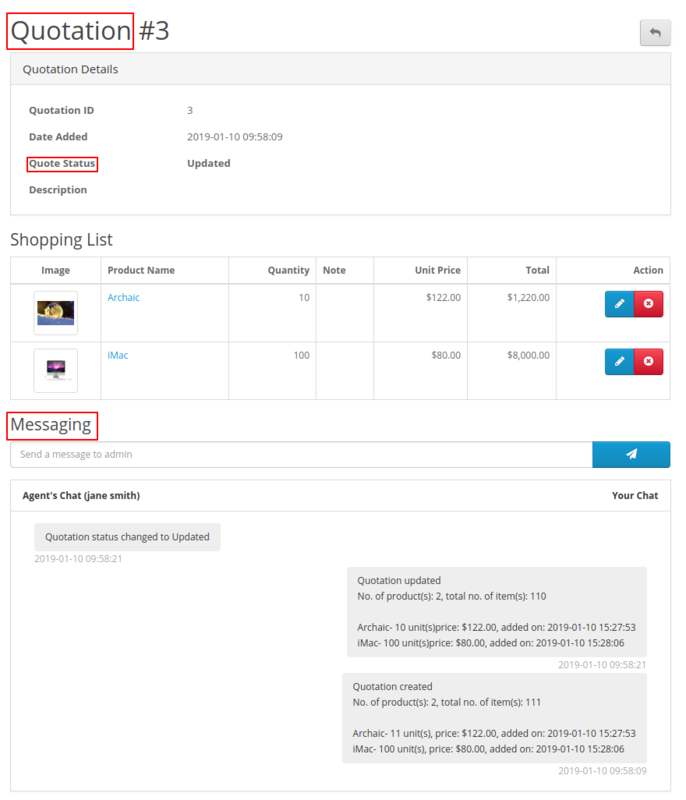 Category Sales Rep: The admin can set the sales rep which will be notified when the customer will message through the category page by selecting the Message Sales Rep as shown in the image below. 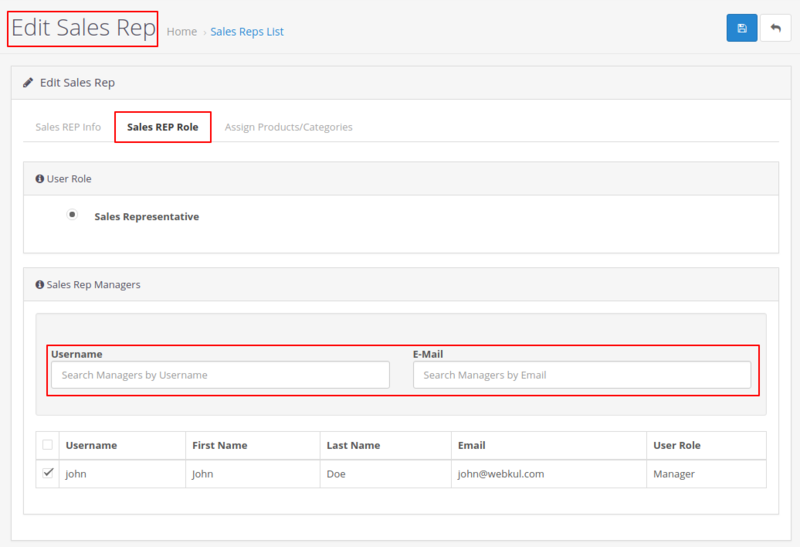 Product Sales Rep: The admin can set the sale rep which will be notified when the customer will message from the product page by selecting the Message Sales Rep as shown in the image below. Maximum Number of Managers of Sales Rep: This option helps the admin set the maximum number of the manager that can be assigned to the sales rep agent. Maximum Team Size: The admin can set the maximum team size which could be feasible. Under the following section, the admin can edit multiple options as shown in the image below. Order Total Title: The admin can set custom order total title in multiple languages. Sort Order: The admin can set the sort order in which the order total title will be displayed. Default Form Field: The admin can set the name which will be used for the conversations and over emails. If left bank then the store name will be taken. Default Form Email: Similar to the default form field, this option allows the admin to set the email used over conversation and emails. All Products Quote Status: If Enabled, the customers can quote for all the products over the store. 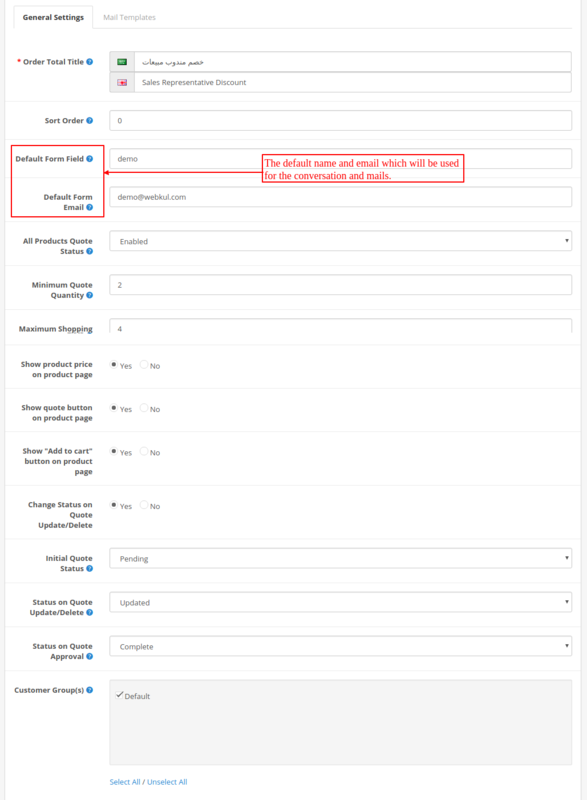 If the admin sets the status as Disabled, then Quote product option will be displayed in which the admin can select the product for which the quote needs to be enabled. Minimum Quote Quantity: The admin can set the minimum quantity below which the customer will not be able to send the quote. Maximum Shopping: The maximum quantity of the shopping list that can be created by the customer. Show product price on product page: Admin can set Yes or No, if we could see the price of the product on the product page. 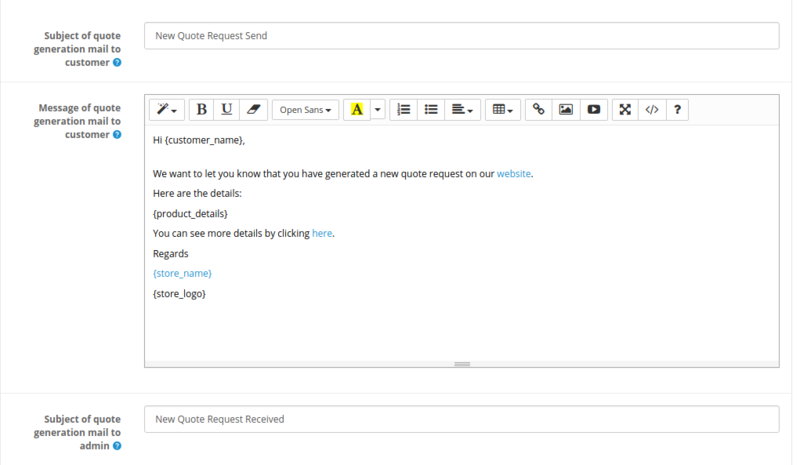 Show quote button on product page: Admin can Enable or Disable the button of ‘Request Quote‘ on the product page. 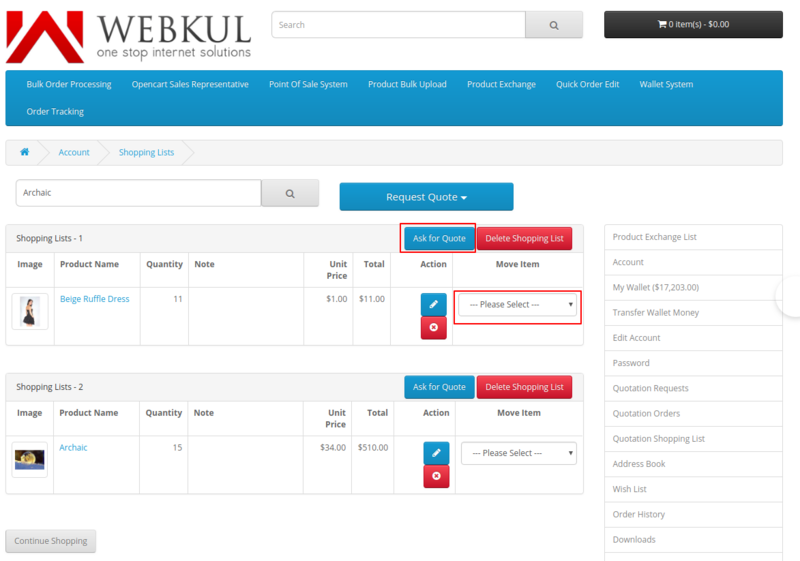 Show “Add to cart” button on product page: Admin can set Yes or No the button of ‘Add To Cart‘ on the product page. Change Status on Quote Update/Delete: Admin can set Yes or No, the functionality where if the customer updates the requested quote or delete any product in the quote request then the status would be changed. Initial Quote Status: Admin can set the status of the quote when for the first time the quote is requested by the customer. Status on Quote Update/Delete: Admin can set the status of the quote when customer Update/Delete the Requested quote. Status on Quote Approval: Admin can set the status of the quote if it is approved by assigned sales representative or admin. 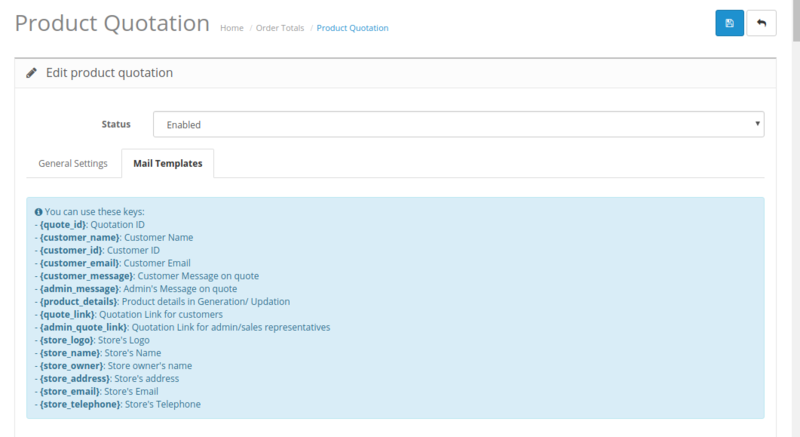 Customer Groups: Using this option admin can select the customer groups who can request the product quote. Subject of quote generation mail to customer- This mail would be sent to the customer when they generate the request for new quote. Subject of quote generation mail to admin- This mail would be sent to admin when the new quote is requested by the customer. Subject of quote updation mail to customer- This mail is sent to the customer when there will be updation in the requested quote. Subject of quote updation mail to admin- This mail would be sent to admin when the customer updates the requested quote. Subject when customer messages admin- This mail is sent to admin with the messages sent by customers. Subject when admin messages customer- This mail is sent to the customer with the messages sent by admin. Subject when admin changes status- This mail is sent to the customer when the admin changes the status of the Requested Quote. Subject when admin assigns sales representative- This mail is sent to the customer when the quote is assigned to a sales representative. Subject when quote notification is sent to Manager- This mail is sent to the Manager when the quote is assigned to the sales rep in that particular Manager’s team. Subject when Customer contacts sales rep- The mail will be sent to the sales rep when the customer messages through the Category or product page. This is an example of mail sent to the customer on Creation of new Quote Request. The admin can provide access and modified permission to the manager and sales representative. For this, the admin needs to navigate to System>User>User Group as shown in the image below. The Admin can click on the edit button to change the permission of sale representatives and managers. The admin can tick various permissions and save them as shown in the image below. Please Note-Here in our module, we have provided some default the access permission- requested a quote, quote orders to the manager and the sales representative. 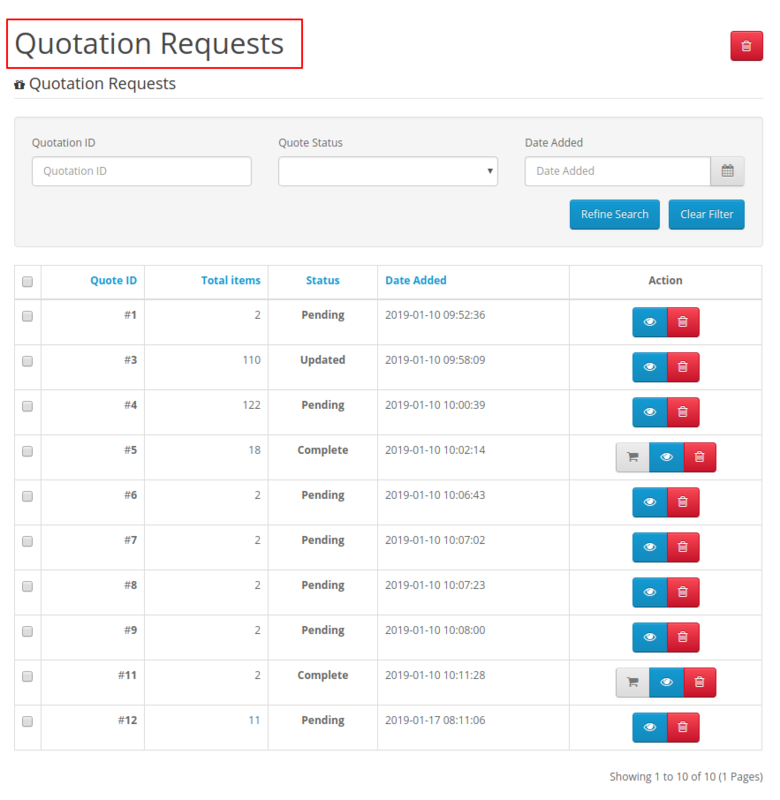 The admin can view all the requested quotations under the following sections. For this, the admin needs to navigate to Sales Representative>Requested Quotations as shown in the image below. Here, the admin could see different quotations from the different customer. Admin can change the status of the multiple quotations here, amongst cancel, complete, update and pending by checking the checkbox in front of the quote. Admin can delete multiple quotes by checking the checkbox in front of the quote and clicking on delete button. Various filtration can be applied like Quotation ID, Customer Name, Date Added, and Quote Status in order to fetch the quotes. On clicking on the view option, the admin will be able to see the Quotation Details and Quotation Messages as shown in the image below. The admin can check the details and can alter the Quotation Status and Sales Representative for the particular Requested quotation selected. 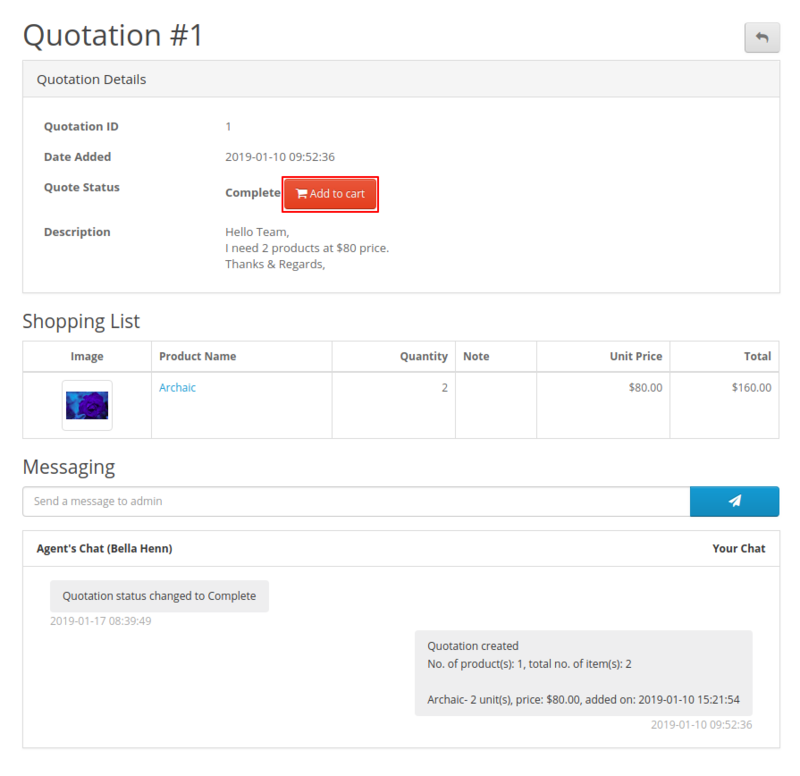 Under the Quotation Message section, the admin can view and converse with customers by sending the message to the customer as shown in the image below. After the requested Quote is ordered by the customer, the following order will be displayed under this section as shown in the image below. 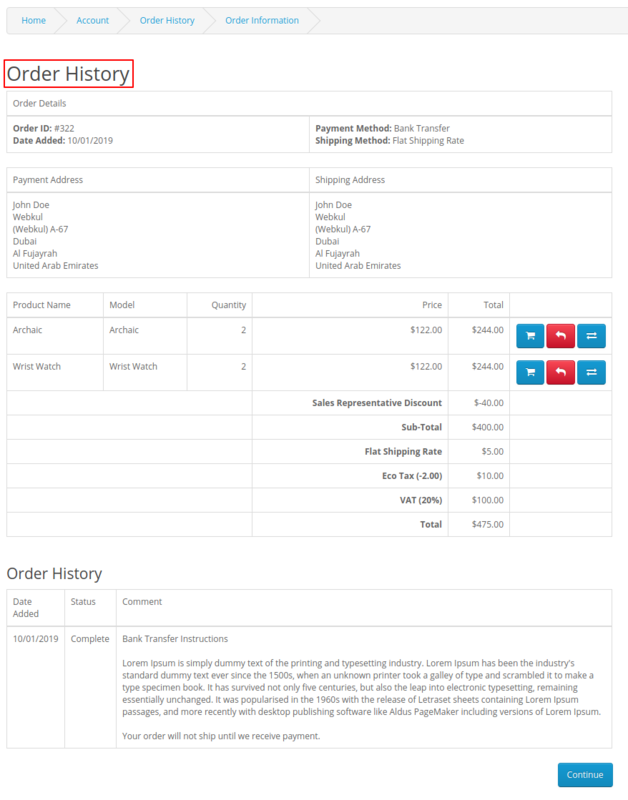 On clicking the View Button, the respective order, customer and quoted item details get displayed as shown in the image below. 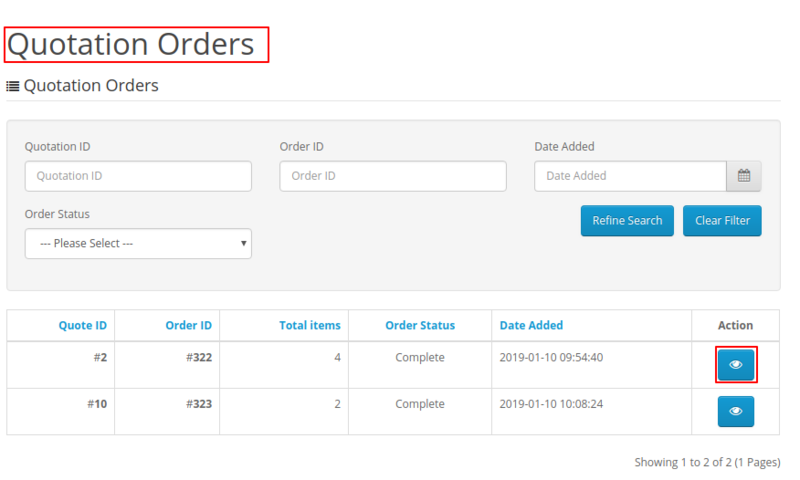 The admin can also select the view order which will redirect the order section where the admin can see all the order details of that particular quoted order as shown in the image below. Admin can add various status or edit existing from here. For instance, status can be- Cancel, Pending, Update or Complete. Admin can add new Status by clicking on Plus sign on right side of the page. Admin can even delete multiple statuses by checking the checkbox in front of the status and click the delete button. Now the admin can either add or edit the status. Quote Status Name– Name of the status which admin can use in admin configuration. Quote Status Color– The color assigned to a particular status. Under the following section, the admin will be able to see the conversation of the various customer regarding the quotation as shown in the image below. On selecting the View button, the admin will be navigated to Quotation Messages of the Quotation Request section as shown in the image below. 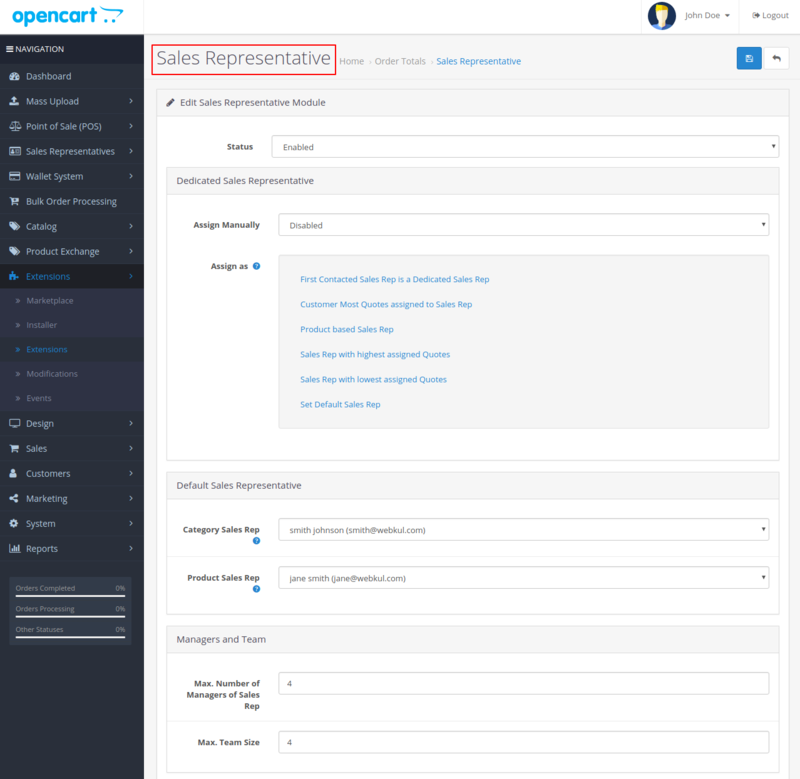 Under the following section, the admin can create new sales rep and can view or modify the existing sales rep agents as shown in the image below. On clicking the edit button, admin can edit the sales rep details like sales rep info, role, and assign product/category. Under the Sales Rep info section, the sales rep details can be edited that are as follow. Username: The admin can set the username which will be assigned to particular Sales Rep.
First Name: The admin can enter the First Name of the Sales Rep.
Last Name: The admin can enter the Last Name of the Sales Rep.
Email: The admin can set the email address on which the sales rep will be notified. Image: Sales rep photo can be uploaded in the following field. Confirm Password: The following password needs to be re-entered. Status: The Status of the Sales Rep can be defined by the admin. The admin can add the roles to the particular Sales Rep in the Sales Rep Role Section. In this section, the admin can assign the manager to a particular Sales Rep. The Managers can be filtered based on the username or the email address as shown in the image below. 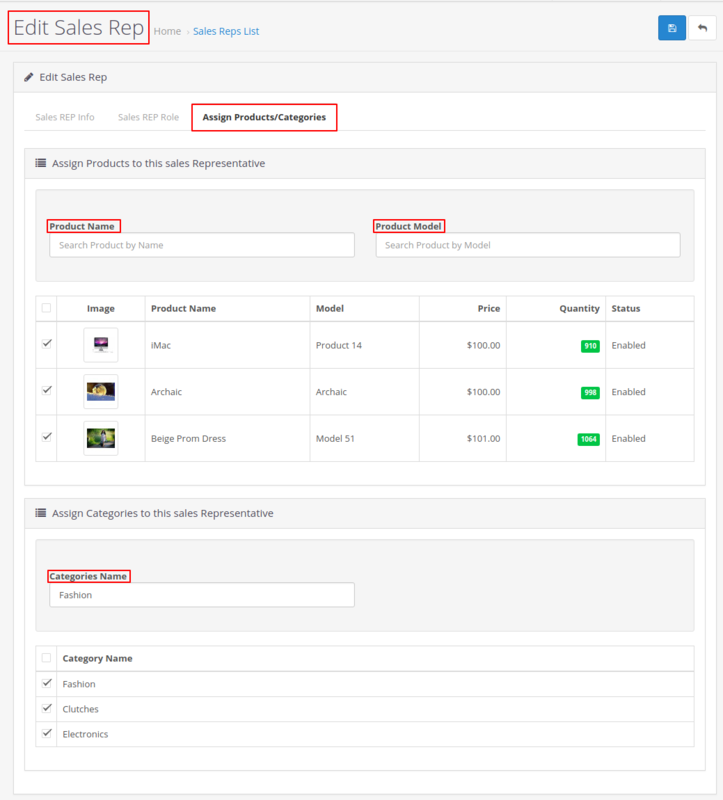 Under the Assign Product/Categories section, the admin can set the products and the categories for which the notifications emails will be sent to respective Sales Rep when the quotation is requested as shown. Admin can create new Managers and can assign Sales Reps to them. The Admin can view the list of manager by navigating to Sales Representative > Managers List. 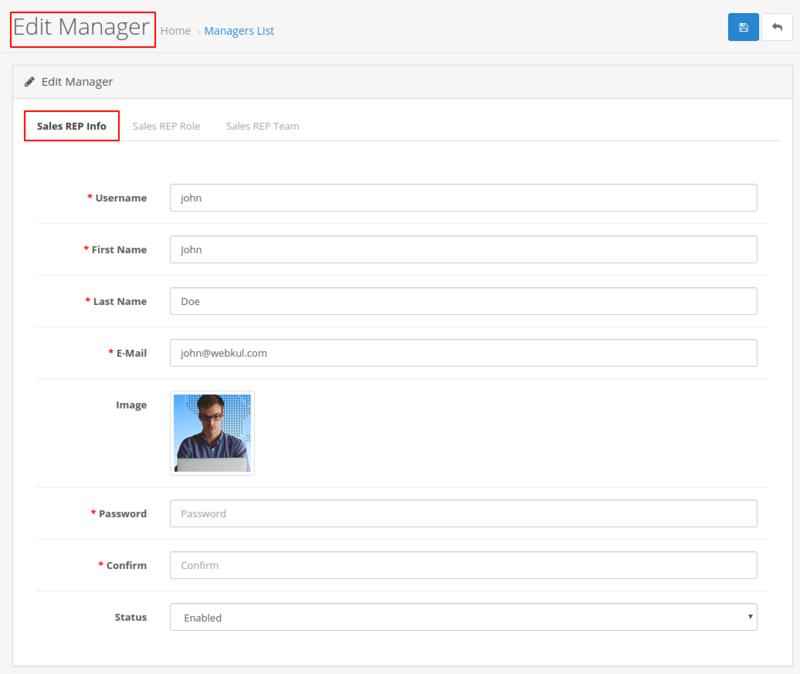 The admin can view the Manager list, edit the existing Managers or can create new once according to the requirement. On clicking on the edit button, the admin can edit the manager’s details. The Admin can view the Manager’s Role under the Sales Rep Role section. The Admin can assign the Team of Sales Rep to the respective Manager. The filtration can be done based on the Username and E-mail address of Sales Rep agents. 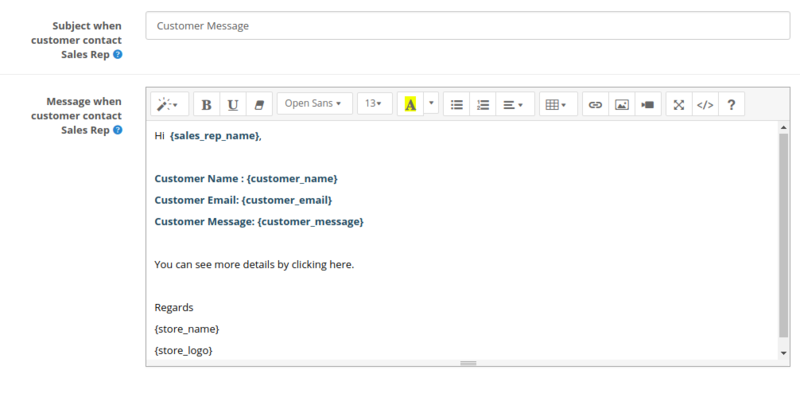 The customer can easily create a request for the quotation by multiple ways. Under the Product Page, the customer can request to quote for the particular product by selecting the Request to Quote button. After that admin needs to select the shopping list as shown in the image below. On selecting any of the shopping list, the pop box will appear with the following information as shown in the image below. The customer can add the required quantity and price per unit and can add a custom note. After that, the customer can click on Add Quote to the shopping list. The customer can request for quotation by navigating to Accounts>Quotation Shopping List. The customer can enter the product for which quote is needed to be requested and assign the requested quote to the shopping list as desired. After the Quote is requested, the product gets added to the shopping list as shown in the image below. The customer can Ask for Quote or Move the item from the one shopping list to another. The customer can even delete the list by selecting the Delete Shopping List. On selection of Ask for Quote, the description box will appear in which the customer can add any custom description if needed as shown in the image below. After the submission, the quote request will be generated. After the Quotation Request, the customer can see the quotation in the Request Quote section as shown in the image below. The customer can check the status of the quote and can view the quote by selecting the view button. The quote will appear with the conversation details between the customer and the sales rep.
On the completion of the status, the customer can add the product to cart with the quoted price. The add to cart button will appear as shown in the image below. The Product with quoted directly from the Request Quotation page or will can also be added to cart from the Quotation page by clicking on Add to Cart page as shown in the image below. After the quotation requested and the customer places an order on the quoted price. The order gets displayed under the following section as shown in the image below. 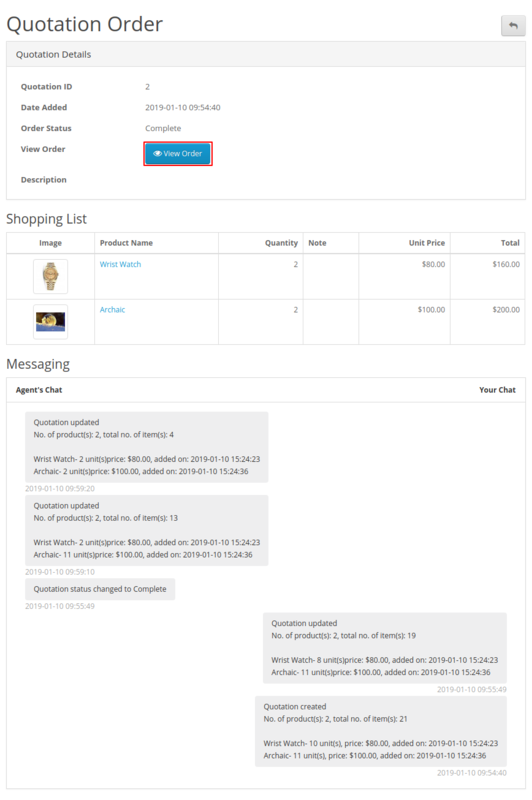 On selecting the view button, the customer can see the quoted order, shopping list, and message as shown in the image below. 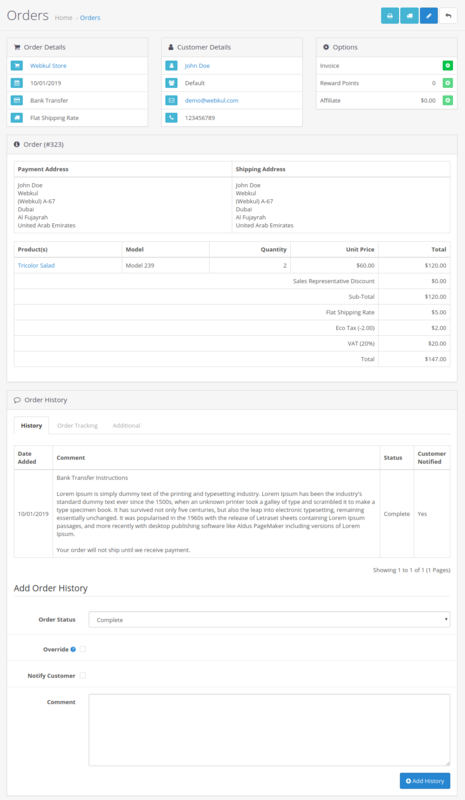 On further selecting the view order button, the customer will be navigated to the order information page in the order history section as shown in the image below. The Sales Rep agent can log in through the admin login page by entering the credential set by the admin. After the login, the Sales Rep can see the following permitted option made available by the admin. In this case, the permission granted is of Requested Quotation and Quote Orders. Under the Requested Quote section, the sales rep agent can check the quoted request. The sales rep can update the status and converse with the customers. Under the Quote Order section, the following quotations will be displayed of the respective Sales Rep agent as shown in the image below. The manager can log in through the admin login page by entering the credential set by the admin. After the login, the Manager can see the following permitted option made available by the admin. In this case, the permission granted is of Requested Quotation and Quote Orders. Under the Requested Quote section, the manager can check the quoted request of all the Sales Rep which are assigned in his team. The Manager can update the status or change the Sales Rep agent. The manager can also converse with the customers. Under the Quote Order section, the following quotation order will be displayed of the Sales Rep under that respective Manager as shown in the image below.